G2: Charming Large Studio directly on the lower parking lot for easy access to all activities! These condos have the living area and sleeping area combined. 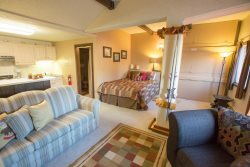 These condos have a separate bedroom as well as sleeping arrangements in the living area.